The floor in your home or commercial property is extremely important. Don’t entrust the installation process with a team that doesn’t have considerable experience. At Infinity Flooring, we have over 15 years of experience polishing concrete and helping Perth clients obtain the flooring of their dreams. How do we Polish your Concrete Floor? Are you interested in the exact process we use to implement your polished concrete flooring? Below we’ll take a look at the intricate details of the entire process! The first step in the concrete floor polishing process is grinding your concrete slab. Our team needs to ensure that your concrete surface is smooth and even, before we begin polishing your new concrete floor. First, we’ll grind down the concrete surface to eliminate uneven spots and remove scratches. Then we’ll smooth-out the concrete surface. Next, we’ll apply the stains you request to improve the aesthetic appeal of your concrete slab. It’s at this stage that your own customisation really comes into play. We’ll make sure to discuss the different stain options before we begin the process of implementing your polished concrete flooring. We’ll also apply densifiers for the floors that need it, though this isn’t always the case. The third step is the honing process. It’s at this stage that we typically polish your concrete floor with a resin. 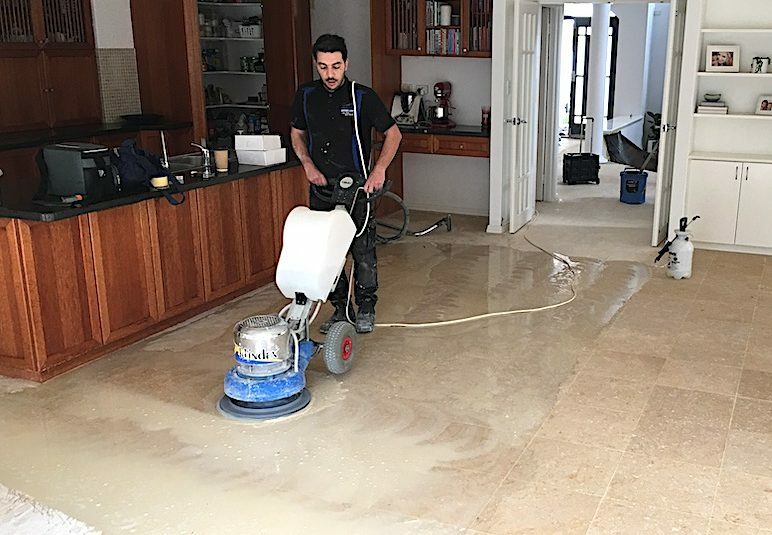 Before this stage, your concrete floor won’t look anything like the finished product, but during honing, you’ll most likely begin to see a recognisable shine appear, your polished concrete floors are coming to life! The type of resin grit that we use will depend on your preferences. Concrete Polishing is one of the most critical stages of the process. It’s this stage that will determine the real shine of your new concrete floors. We’ll use further resin grits ranging from 50 to 3000 depending on the level of shine you’re looking for. Our team will make sure to discuss shine and girt requirements with you before we begin the concrete polishing process. To finally finish off your new concrete floors, our team will use a high-end burnishing pad to clean up the concrete and create a little extra sparkle on your new concrete floor. Finally, it’s your time to enjoy it! Remember, polishing concrete is no easy feat—you shouldn’t attempt any of the above steps without having an expert team implementing your new polished concrete floor. Just because your concrete slab is in place, doesn’t mean it doesn’t take considerable experience to create the perfect polished concrete flooring. HiPERFLOOR is the most advanced finish available in the industry. This type of finish truly enhances your polished concrete flooring. It’s one of the best ways to obtain the type of shine you’re looking for. It also helps protect your concrete flooring from scratches and marks. If you’re looking to ensure that your floor is implemented precisely how it’s intended to be, make sure to work with a team that understands HiPERFLOOR. We are one of the only fully accredited HiPERFLOOR installation teams in Australia. Husqvarna awarded us this accreditation due to our skill in implementing HiPERFLOOR finishing. Polished Concrete Floors Perth: Why Choose Infinity Flooring? The floor in your home or commercial property is extremely important. Don’t entrust the installation process with a team that doesn’t have considerable experience. At Infinity Flooring, we have over 15 years of experience helping Perth clients obtain the flooring of their dreams. We’re one of the only accredited HiPERFLOOR finishing partners in the area. We also ensure our entire team of experts is trained to the BICS standards. If you want to start the process of implementing a brand-new polished concrete floor, get in touch with our team today!